This fall Farmer Auctions is selling a collection of almost 400 unique match strikers. You might be asking, as I did, “What is a match striker?” Typically simple objects, the only two requirements for their design are: a cup to hold matches and a rough surface for striking. While matchbooks and boxes were perfectly adequate ways of holding matches (and themselves experienced their own design renaissance) the prevalence of matches during the turn of the twentieth century paved the way for the match striker, a decorative solution to match storage. The height of match striker production and use occurred in Europe during the late 19th and early 20th centuries. They were particularly popular in England and France. Designs ranged from abstract to decorative to figural. Examples in our collection appear in porcelain, metal, glass, stoneware, terra cotta, and Bakelite, and were manufactured by Wedgewood, Royal Doulton, and Limoges, among others. Most commonly match strikers were ceramic objects, roughly 1-5” tall with a similar range in diameter. Forms were typically spherical, conical, or featured a round, flat base with an elevated cup for holding the matches. Small and easily shippable, many of the European designs made their way to America in travelers’ suitcases. The function and mobility of match strikers made them ideal modes of advertisement. 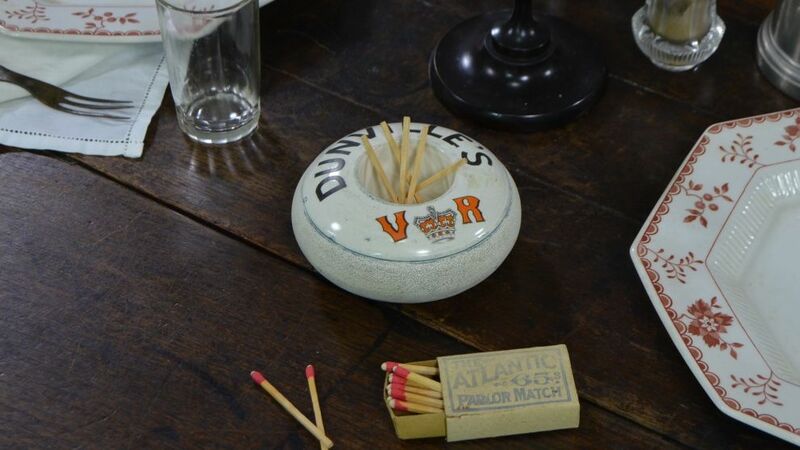 Often advertising match strikers took the form of a low, sturdy, ceramic bowl. These pieces relied on uniquely designed typography to convey their messages. They were particularly effective at advertising gastronomic delights and accessories, including alcohol, tobacco, and knives. Advertising match strikers, especially those from France, are some of the most popular varieties in the contemporary market. Our current reliance on electricity makes it hard to imagine a time when people depended on candles and oil lamps as their main source of light or fireplaces to keep them warm. The match, however, was an essential facilitator in necessary daily rituals. Matches even inspired short stories, workers’ strikes, and new design forms. As matches themselves are more frequently seen as items for emergency kits and doomsday preppers, match strikers keenly remind us of bygone days. Today fire is viewed as something to avoid and put out as quickly as possible. Modern civil servants educate the public about fire codes, fire safety, and smoke detector laws. Match strikers help us remember that within this century, however, fire was an everyday occurance in homes across the globe and was an essential element of survival, providing heat, cooking food, and lighting the way for the people of the past. Today phillumenists (collectors of matchbooks and match related items) continue to be inspired by these pieces of the past. As sturdy, egalitarian objects match strikers sit, their round wells offering up potential. Whether it is the potential energy in the head of a match, facilitating the simple pleasure of a successful strike, or the potential to contemplate past ways of life; the potential conveyed by the match strikers’ form and function is what makes them so captivating, even to a modern audience.